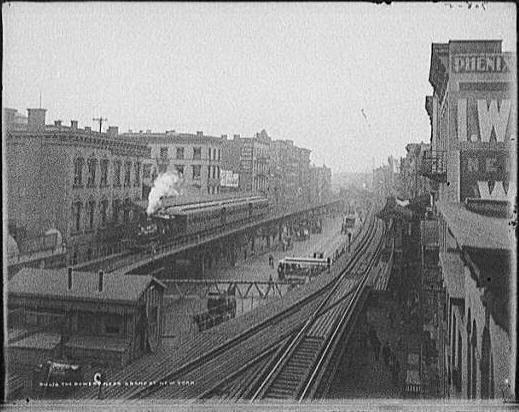 The New York Elevated Railroad was not a car builder. It was a standard gauge railroad under the control of Jay Gould from which the narrow gauge South Park Railroad acquired six passenger cars in 1880. At that time, New York's elevated railways were powered by steam engines, albeit much smaller than on the South Park, so the South Park’s Mason-Bogies would not be dragging around a string of former electric traction cars. The New York Elevated Railroad Company was born 27 October 1872, as a reorganization of the bankrupt West Side Patented Elevated Railway Company, the first attempt anywhere at building an elevated rapid transit line. 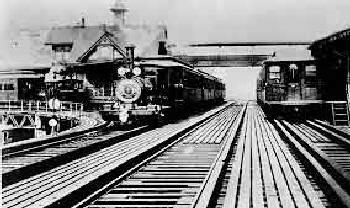 (If you would like to know more about the beginnings of the New York elevated railroad system, click HERE. Otherwise continue onward!) The NYERR Company was capitalized at $10 million. But the next year (1873), before much could be done by way of expansion, the country was thrown into another financial panic which would make raising funds for any purpose hard for several years. New York Elevated Railroad 6th Avenue line, 1886. The ostensible failure of these two lines, the depression, the opposition of property owners, the incessant lobbying in Albany of streetcar companies who feared competition from rapid transit, and New York City’s great and immediate need for some kind of rapid transit, spurred several prominent New Yorkers and interested groups to consider municipal construction. A bill was proposed to the Legislature that called for the creation of a rapid transit commission with authority to select routes and devise plans for a four track rapid transit road. This bill was defeated. Once the use of municipal funds had been ruled out, subsequent developments appear almost to have followed a prepared script. It was decided not to initiate new rapid transit enterprises, but rather to encourage and smooth the way for those that already existed. This shut the door definitively on subway construction, and also signified that the city and its citizens would accept whatever the existing elevated lines -- the New York and Gilbert companies -- were willing to provide. In effect, it was no decision at all, but an acquiescence in a decision that had already been made by private capital, and which government, spurred on by now unified public support, real estate interests, prominent businessmen, and, most important of all, the principal stockholders in the two elevated companies, now hurried to confirm and further. A bill was passed, known as the Husted Act, authorizing the Mayor of New York to appoint a five-man Rapid Transit Commission (RTC) with the power to lay down rules and conceive plans for rapid transit construction and operation. The RTC was accorded the power to create new private corporations and to supervise both their organization and their subsequent construction of rapid transit roads. Provision was also made for the RTC to recognize the existence and supervise extension of the lines of the established elevated companies. If it selected routes which were identical to those held by existing lines, it could incorporate these lines anew as companies specially formed under the Husted Act. The routes the RTC picked just happened to correspond with the routes on 6th and 9th Avenues previously accorded the New York and Gilbert companies. The old charters of these firms were thereby reconfirmed by the RTC, which also gave them permission to construct and expand their lines on the West Side, and to build new lines on the East Side along 2nd and 3rd Avenues, all of which were to extend to the Harlem River. In the event that these two companies failed to build or did not build their roads according to schedule, the RTC, availing itself of the provisions of the Husted Act, also formed a new corporation, the Manhattan Elevated Company, organized with an initial capital stock of $2 million, which, by happy coincidence, was quickly subscribed for in equal parts by the major shareholders of the two railroads with prior franchises. In the early days of elevated roads, before the RTC, investors were few and capital insufficient. After 1875 the elevated roads attracted a whole new breed of capitalist: men like Jose Navarro, who actually built the Gilbert road through the medium of his New York Loan and Improvement Company; Cyrus Field, the man responsible for the Atlantic cable, who took over the New York Elevated road in 1877; and, finally, two of the very greatest of the “robber barons,” Jay Gould and his friend Russell Sage. 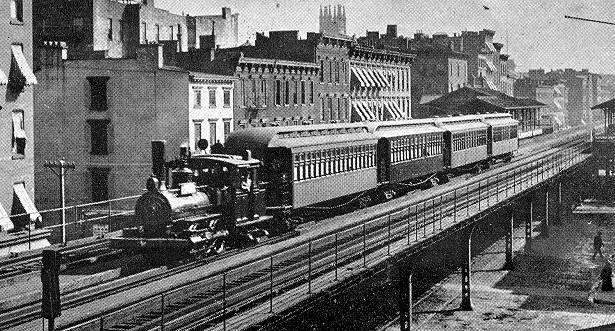 By 1876 the NYERR had been extended to 61st street and was serving ten stations with 15 engines and 21 cars. Business was good and becoming better all the time. During the succeeding years it was further extended to Central Park, and to a considerable extent was double tracked. In 1878, it constructed its East Side, or Third Avenue branch, from The Battery to 129th street, with branches to City Hall, to the 34th Street Ferry, and to the Grand Central Depot at 42d street, making some nine miles of double track. During the year ending Sept. 30, 1878, the NYERR had carried 14,000,000 passengers. Owing to the enormous traffic on the Third Avenue branch, it carried nearly that many in only the next six months. On the 20th of May, 1879, the NYERR and the Gilbert (now Metropolitan) lines were leased to the Manhattan Company, thus bringing both roads under one direction. After that the extension of the system went on rapidly. On the West Side the continuation of the NYERR above 59th street was merged into that of the Metropolitan, and above 83d street the road was continued in the style of the Metropolitan. Trains ran as far as 135th Street and Eighth Avenue, and in a little while the road would reach its northern terminus at 158th street and the Harlem River. By that time, Jay Gould, owner of the New York World newspaper (1879-1883), and controlling stockholder of the Union Pacific railroad, had become a major investor in the telegraph and mass transit businesses. In 1881, he bought controlling shares in Western Union, which handled most of the nation's telegraphing, and began buying stock in the Manhattan Elevated Railroad. In 1884, through lengthy and complicated manipulation of its stock, Gould gained control of the Manhattan Company, thus establishing control over the only form of rapid transit existing in the world's second largest city. The financial panic of May 1884 forced Gould off Wall Street, but he continued his business interests, as with the Union Pacific, his management increased the efficiency and profitability of the elevated railroad companies. In 1886 Gould gained ownership control of the Metropolitan Elevated Railroad and of the New York Elevated Railroad. In 1887 he and Sage were able to force Cyrus Field, previous owner of the New York Elevated, to relinquish his substantial shares in the Manhattan Company and sell his stock to them. But within the year Gould had contracted tuberculosis, and four years later he died. After his death his estate and interests were managed by his son, George Jay Gould, himself an owner and manager of railroads, who had long been associated with his father. In 1891, the younger Gould became president of the Manhattan Railway Company. 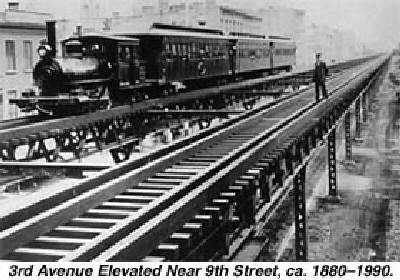 The 9th Ave line played host to various tests of electric operation between 1885 and 1900 and went to all electric train operation in 1903.